Become an IMGA online jury member! Alvaro G Buitrago better known as Alvaro845, is a Spanish Youtuber focused on mobile games with more than 4 million subscribers. 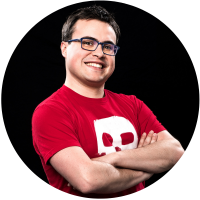 He has a degree in Law and Business Administration and is also founder and CEO of Team Queso, an esports organization leader in mobile games. Subscribe to our newsletter and we will keep in touch! Cooking Diary fans vote MyTona for People’s Choice Award! Doing flips for Jury’s Honorable Mention winner, Deedema!